The Business Leadership Council is the umbrella organization for all College of Business registered student organizations. The organization consists of one representative from each of the 15 student organizations and one general representative of the student body. The Business Leadership Council’s goal is to work for the betterment of the students and RSOs within the college and assist the students of the college. It does this by coordinating among the RSOs within the college, increasing student involvement with the College of Business providing leadership opportunities. The Business Leadership Council works carefully to ensure that all of the college’s RSOs are cooperative and brought together to make the college better. The Business Leadership Council is involved with many events throughout the year, including Zumba for Hope, Homecoming, Career Enhancement Week and Big Dawg Olympics. The organization is very active and is striving to be an even bigger voice within the college and school community. 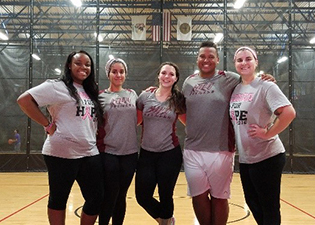 On Oct. 20, the Business Leadership Council hosted its Zumba for Hope Event in the Student Recreation Center. The event raised money for the Southern Illinois Healthcare Cancer Institute. The year’s Zumba for Hope event raised money for the Southern Illinois Healthcare Cancer Institute to support its project. For more information or how to become a member of the Business Leadership Council, please contact Courtney Lucas at courtney.lucas14@siu.edu. Business Leadership Council meetings take place on Wednesdays at 5:00 p.m. in Rehn 108. Membership for this RSO is free.